The Celestion UL-10 is a three-way loudspeaker system utilizing a 254 mm (10 in.) woofer, a 51 mm (2 in.) dome midrange driver, and a 19 mm (3/4 in.) dome tweeter. The acoustic suspension mode is used for the woofer, which handles frequencies up to the first crossover at 700 Hz, with the midrange extending from 700 Hz to 5 kHz and the tweeter taking over above 5 kHz. The enclosure is finished in walnut on the sides and top, and a black cloth grille accents the front surface. The enclosure has a tall and lean look, standing 673 mm tall (26 1/2 in.) and measuring only 317.5 mm wide (12 in.) and 381 mm deep (15 in.). At 22.68 kg (50 lbs), one might want to assure themselves that any off-floor mounting surface, such as a bookshelf, was capable of safely handling the weight. If this speaker is mounted off the floor, I recommend that snubbers or some other method of preventing the unit from sliding off its mounting surface be provided in the event 46 there are toddlers around, who might pull a speaker off such a shelf. Access to the speaker terminals is by means of well marked, five-way terminals placed in a recessed cavity on the rear of the enclosure. Speakers: One 10-in. woofer, one 2-in. dome midrange, and one 3/4-in. dome tweeter. Frequency Response: 40 Hz-20 kHz ±2 dB. Power Rating: 50 watts continuous rms sine wave. Impedance: 8 ohms nominal, 4 ohms minimum. Crossover Frequencies: 700 Hz and 5 kHz. Size: 12 1/2 in. (31.75 cm) W x 15 in. (38.1 cm) D x 26 1/2 in. (67.3 cm) H.
Weight: 50 lbs. (22.68 kg). The terminal impedance which the Celestion UL-10 presents to a power amplifier is shown in Figs. 1 and 2. 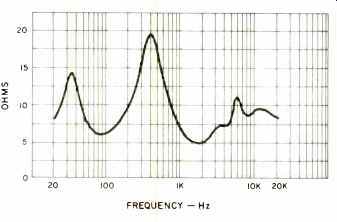 Unlike most loudspeakers, the highest impedance peak in the audible spectrum is not the bass resonance rise, but rather the midrange impedance peak at 400 Hz. 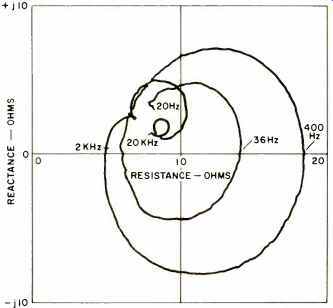 From the standpoint of amplifier loading, the lowest value of impedance is 5 ohms, resistive, at 2kHz, while the most severe phase angle is approximately 45 degrees, lagging, at a frequency of 800 Hz. I would recommend that this speaker be treated as though it were 5 ohms, which means that parallel hookup to a single amplifier terminal is to be avoided and heavy gauge wire used for connection. 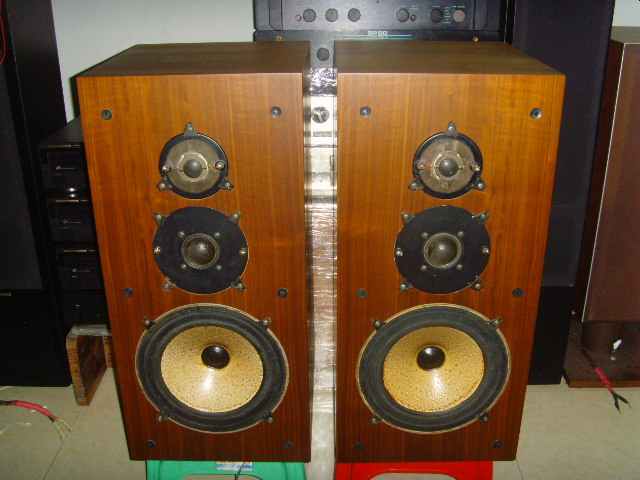 With these simple precautions taken, there should be no difficulty driving this loudspeaker from any quality amplifier. The one-meter anechoic frequency response is shown in Fig. 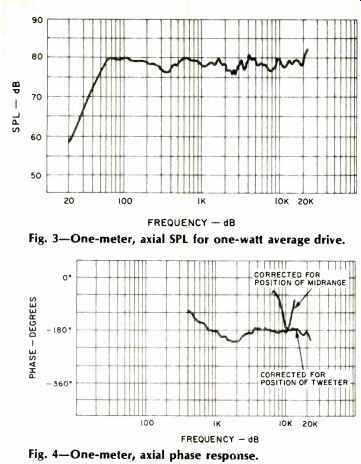 3 for the amplitude of sound pressure level with a one watt average drive, and Fig. 4 is the measured phase angle under the same conditions. The amplitude response is unusually flat from 50 Hz to above 20 kHz; this response was measured directly on axis. The output is moderately low at a one-watt average level so that a higher powered amplifier may prove necessary if you prefer very loud listening. Celestion recommends that 40 watts minimum be used. I think this may be marginal, since this speaker can soak up the output from many super power amplifiers without sounding too loud. Fig. 3-One-meter, axial SPL for one-watt average drive. / Fig. 4-One-meter, axial phase response. The phase response of Fig. 4 is also extremely uniform, and the response is principally minimum phase with exception of the crossover frequency ranges around 1 and 10 kHz. Two measurements were made for the data shown here. The lower frequency phase curve is corrected for the acoustic path length of the midrange driver, while the higher frequency curve is corrected for the acoustic distance to the tweeter. These curves reveal that the acoustic position of the midrange driver is 37 mm behind that of the tweeter. The acoustic position of the woofers lies, in turn, behind the midrange unit, as shown by the increase in phase slope below 1 kHz. Both the midrange and tweeter are phased at 180 degrees with respect to the woofer, which means that a positive-going voltage applied to the loudspeaker terminal in the polarity indicated by Celestion will produce a pressure increase for the sound contributed by the woofer, and a pressure decrease for the sound contributed by the midrange and tweeter. The results of the three-meter room response measurement are shown in Figs. 5 and 6 for two separate loudspeaker positions. Fig. 5 is the response measured for the loudspeaker placed on the floor and against a back wall, while Fig. 6 is the same configuration, but raised 67 cm (26 in.) above the floor to place the system at normal listening ear level. A comparison of this measurement with the anechoic response, Fig. 3, shows the results to be quite different. The reason is that the anechoic response shows what the loudspeaker is capable of doing when there are no wall or floor reflections, while the room test is intended to measure the spectrum balance perceived while listening in a room. 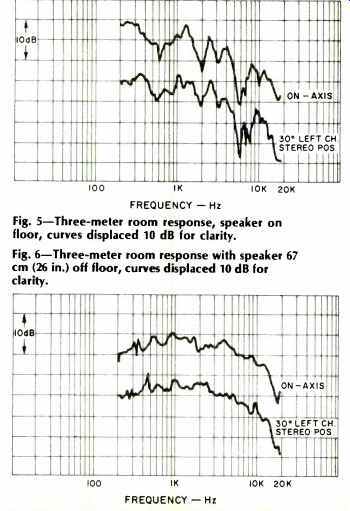 The tonal of these room measurements is in good agreement with the impression which I had while performing the earlier listening test. When the speakers were placed on the floor, I sensed that the bass was heavy and the response fell off with increasing frequency. For best tonal balance, therefore, I recommend that the Celestions be elevated to ear level and rotated toward the listening area. The polar response is shown in Figs. 7 and 8. It is apparent that there is a good left-right symmetry, and that the sound is launched slightly upward. The substantial amount of sound launched upward indicates that this speaker should not be placed close to overhanging shelves or other structures that might cause sound to be reflected back into the listening area. Lateral stereo imagery should be reasonably good, as indicated from this data. Harmonic distortion for the tones of E1 (or 41.2 Hz), A2 (110 Hz), and A4 (440 Hz) is shown in Fig. 9. 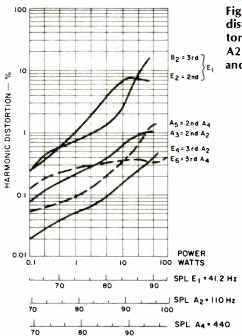 With the exception of the higher level reproduction of 41 Hz, the harmonic distortion is quite low and indicates clean response for solo instruments. Fig. 5-Three-meter room response, speaker floor, curves displaced 10 dB for clarity. / Fig. 6-Three-meter room response with speaker 67 cm (26 in.) off floor, curves displaced 10 dB for clarity. Fig. 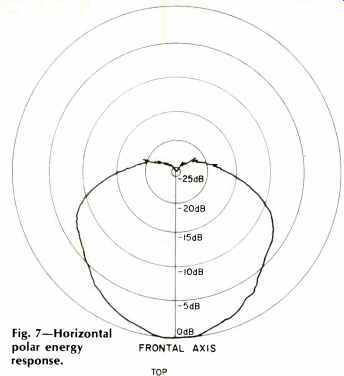 7-Horizontal polar energy response. Fig. 8-Vertical BOTTOM polar energy response. Intermodulation of A4 by El (440 Hz by 41 Hz) is shown in Fig. 10. At low levels, the intermodulation is principally due to amplitude modulation of A4, while at higher levels the characteristic changes to phase modulation. At 10 watts average drive, there is 2 percent peak-to-peak amplitude modulation and 5 degrees peak-to-peak phase modulation, while at 40 watts the phase modulation has increased to 18 degrees peak to peak with no increase in amplitude modulation. This indicates that some small change of instrumental timbre may be experienced at high levels when there is substantial bass energy present. The Celestion UL-10 is remarkably free of distortion in its linearity of response to single tones. A one-decibel increase in voltage produces almost exactly a one decibel increase in sound pressure level throughout the range from one-tenth watt to 100 watts for tone bursts of middle C (262 Hz) and A4 (440 Hz). This is a measure of acoustic transfer-gain uniformity and indicates that stereo placement of solo instruments should not be effected by changes in dynamics of that instrument. The Celestion was not as good in its ability to handle a large number of incoherently related tones, such as orchestral peaks, as indicated by our crescendo handling test. An inner musical voice at middle C is reduced by one-half dB when a random noise signal of 2 watts average level is superimposed. At A4 or 440 Hz, the effect is stronger, and 2 dB of compression occurs for a superimposed noise of one-half watt average. 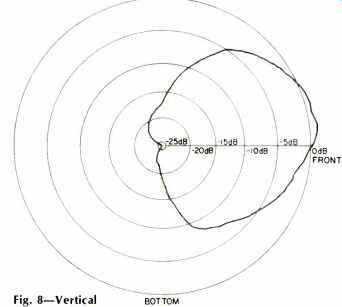 In both cases, the inner musical voice had an average level of 20 dB below that of the noise when measured over the frequency range from 20 Hz to 20 kHz at the loudspeaker terminals. The interpretation of this measurement, in conjunction with the other distortion measurements, is that the subjective effect will be that of a gain compression amplifier in the system which tends to cause some lateral blurring of the stereo illusion during loud orchestral passages. The energy-time response, which is the amount of time spread of a perfect impulsive signal, is shown in Fig. 11 and indicates a moderately good reproduction of the attack on transient sounds. The tweeter signal arrives at 3 milliseconds, for a one-meter air path, and the main peak at 3.1 milliseconds is due to the midrange unit. The higher-frequency contribution from the woofer arrives at around 3.3 milliseconds and is followed by small and probably unimportant diffraction peaks for the next millisecond. Fig. 9-Harmonic distortion for the tones E1 (41.2 Hz), A2 (110 Hz), and A4 (440 Hz). The physical configuration of the Celestion UI-10 is such that it may be placed either on the floor or on a shelf. Both positions were tried for the listening test, and it was clearly evident that off-the-floor mounting is to be preferred from the standpoint of producing the better tonal balance. I also found that I preferred the speakers placed against a back wall and rotated so as to point toward the listening area. With this position, it was my opinion that there was a mild dominance of mid-bass, around 100 Hz, and a roll-off of response with increasing frequency. I found that I could produce what seemed to be a more balanced sound by setting my Marantz preamp tone controls for a bass drop of 2 dB at 100 Hz and a treble rise of 3 dB at 10 kHz. The average response of the UL-10 is reasonably uniform from the octave below middle C to about 10 kHz, though in my opinion the system lacks a super low bass and super top end. This speaker is rather inefficient, and when attempting to drive it at high levels, I found that I had to be careful-particularly with clean recorded material-in order to prevent lighting the clipping indicator on the Marantz 510 used to drive the system. This amp has a lot of clean horsepower, and I was afraid I might blow a voice coil trying to raise the sound level to moderate rock pressures. No apparent damage was done, though I would recommend protecting this loudspeaker with 2-amp, fast-blow fuses if high level rock is your thing. The stereo image on orchestral music has a decent sense of lateralization of instruments, but lacked something of a sense of depth in my opinion. My impression was of an orchestra painted on a canvas stretched between the two systems. Female vocals appeared slightly back in the stereo image, with an apparent lack of midrange. When the sound level began to punch, the sonic impression I had was of gain compression pulling down the middle register relative level. Piano music was definitely warm, with some lack of bite on loud passages and a slight dominance in the lower register. This sound will be pleasing to some, but it did not seem to me to be completely accurate reproduction of this difficult instrument. Though not a star performer with rock material, the Celestion UL-10 does a creditable job on certain types of orchestral material.